From The Sisterhood, Michael Palmer's first "New York Times" bestseller, to The Patient, his ninth, reviewers have proclaimed him a master of medical suspense. 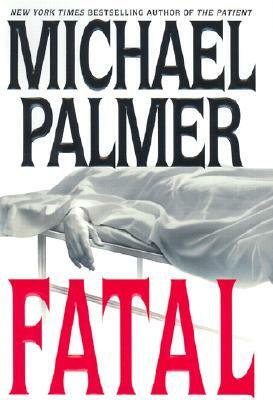 Recognized around the world for original, topical, nail-biting suspense, emergency physician Palmer'swork has been translated into more than thirty-five languages. Now he reaches controversial and startling new heights in a terrifying tale of cutting-edge microbiology, unbridled greed, and murder, where either knowing too little or trusting too much can be FATAL. In Chicago, a pregnant cafeteria worker suffering nothing more malevolent than flulike symptoms begins hemorrhaging from every part of her body. In Boston, a brilliant musician, her face disfigured by an unknown disease, rapidly descends into a lethal paranoia. In Belinda, West Virginia, a miner suddenly goes berserk, causing a cave-in that kills two of his co-workers. Finding the link between these events could prove FATAL. Five years ago, internist and emergency specialist Matt Rutledge returned to his West Virginia home to marry his high-school sweetheart and open a practice. He also had a score to settle. His father died while working for the Belinda Coal and Coke Company, and Matt swore to expose the mine's health and safety violations. When his beloved Ginny succumbed to an unusual cancer, his campaign became even more bitterly personal. Now Matt has identified two bizarre cases of what he has dubbed the Belinda Syndrome--caused, he is certain, by the mine's careless disposal of toxic chemicals. All he needs is proof. Meanwhile, two women, unknown to one another, are drawn inexorably to Belinda, into Matt's life--and into mortal danger.Massachusetts coroner Nikki Solari comes to attend the funeral of her roommate, killed violently on a Boston street. Ellen Kroft, a retired schoolteacher from Maryland, seeks the remorseless killer who has threatened to destroy her and her family.Three strangers--Rutledge, Solari, and Kroft--each hold one piece of a puzzle they must solve, and solve quickly. If they don't, it will be far more than just their own lives that are at risk. Michael Palmer has crafted a novel of breathtaking speed and medical intricacy where nothing is as it seems and one false step could be FATAL.